In August, two-time Wimbledon Champion, Evonne Goolagong-Cawley joined Blacktown Mayor Stephen Bali and Tennis Australia president, Stephen Healey, to officially open the $16 million Blacktown Leisure and Tennis Centre. In her speech, Mrs Goolagong-Cawley emphasised the importance of such centres in nurturing the next generation of Australian tennis champions. Tennis Australia president Stephen Healey commented that the centre was the biggest single investment in a tennis facility by a local government in NSW, represented a “landmark project” in a key growth area of western Sydney. 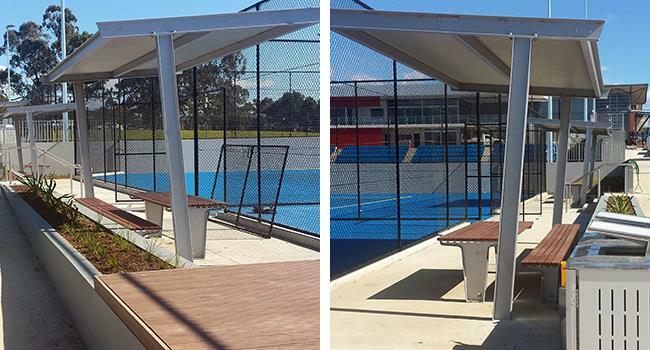 Landmark Products partnered with Statewide Civil to complete the first stage, providing 14 cantilever (King Series) shelters and four custom hardwood picnic tables and benches, installed for spectators and attendees behind the tennis courts. The state-of-the-art centre features 16 Plexicushion courts, including four championship size courts, an exhibition court, grandstand seating for 288 spectators, administration and tournament office, function room, change room, toilets, children’s play area with tennis rebound walls and additional car parking. Although built primarily for use by the people of Blacktown and surrounding suburbs, it is envisioned that the centre may also host national and international tournaments. 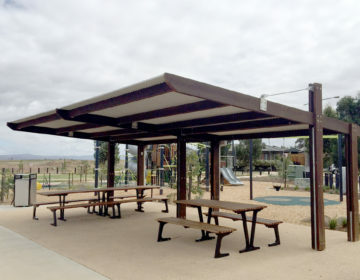 The contemporary King Series shelters supplied by Landmark for the centre were pre-manufactured in all-steel and hot dipped galvanised which provides longevity against high public use and enduring weather conditions. 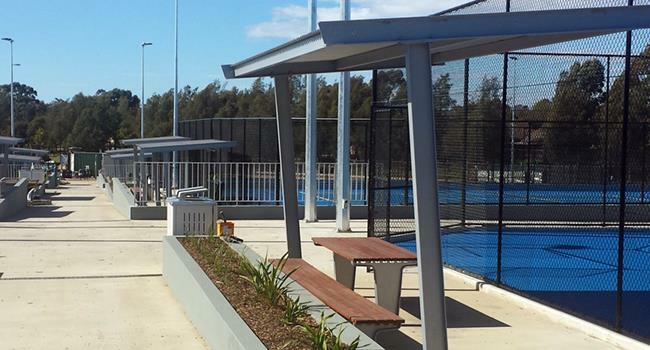 The cantilevered roof type, constructed in Colorbond XRW custom orb offers extended clear coverage, cooler shading and a low maintenance solution – all critical aspects for the Blacktown centre or in fact, any outdoor sporting venue. Each shelter measures 5.7 metres by 2.8 metres with only two in-ground posts, finished in a silver colour powder coating to complement the area’s design aesthetics. 4 custom plinth bench seats were also installed in various locations around the area, they are manufactured with treated Australian hardwood slats and hot dipped galvanised steel frames. 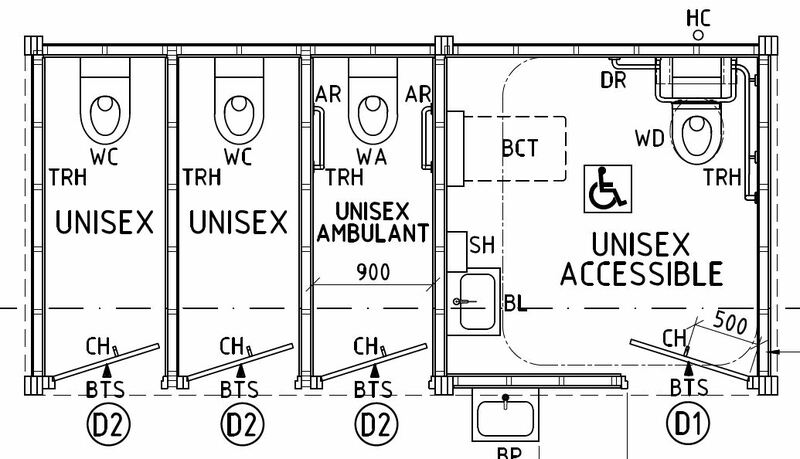 The shelters and seats were manufactured and delivered in convenient flat pack kits. Installation took place in two stages: six shelters first, with the remainder installed three months later, after civil and landscape work was finished. Landmark Products thanks Statewide Civil and Blacktown City Council for entrusting our expertise for this significant project, and are proud to contribute to the sporting culture of the Blacktown region. 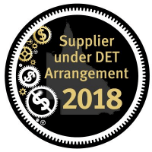 With stage two in the pipeline – 12 clay courts to make the centre the largest Tier One national tennis training centre in Australia – we hope to work with these great organisations in the future.